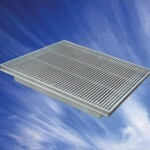 Our Range of Floor Grilles include the Model TJH (HDA), Model TJM (MDA) and light duty style (LDA) floor grilles. They have been specifically designed to suit current industry requirements. With more and more buildings employing raised access floors in all types of applications from offices, computer rooms, telephone exchanges to universities and scientific establishments, installing the correct type of floor grille has never been more important. Model TJH (HDA) Floor Grille, Model TJM (MDA) Floor Grille and the light duty floor grille (LDA) are principally designed as a tile replacement grille to replace a standard 600mm square tile in raised access floor systems. These floor grilles are aesthetically pleasing air distribution devices providing cool air exactly where required, eliminating high temperatures and reducing the risk of equipment failure. The Light Duty Floor Grille has been designed to handle a light loading of traffic. A typical installation might see this type of floor grille installed in a private residence, small to medium sized office areas and care homes, though many other suitable application exist. They are constructed from aluminium extrusions, making them durable and easy to maintain. They also offer high performance levels for all types of air distribution. 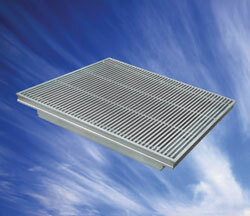 All our tile replacement floor grilles are suitable for both supply and return air situations. An optional opposed blade volume control damper can also be installed (OBD) with easy adjustment available through the floor grille face. Our range of Rigidcore and Flexicore grilles are designed for use with under floor perimeter heating or ventilation systems and are ideal for applications requiring a lay-in core. The Rigidcore (RGD) types are available in section lengths up to 600mm and incorporate location pins in the tube ends for ease of alignment. The Flexicore (FLX) types use a flexible nylon tube to retain the blades and are more suitable for long continuous applications of up to 3m. Both core types are available with either 12.5mm or 19mm blade pitches and can be supplied with a recessed or flanged frame if required.